One of my favourite Christmas traditions is the good old Advent calendar – the countdown to the big day from the 1st of December. In my Catholic upbringing and schooling, Advent was a big deal, lighting of candles on the Advent wreath, preparing for baby Jesus’ birth – all very momentous and suspense building! My mum used to buy my sister and I those cardboard Advent calendars full of cheap chocolates from the supermarket most years (probably from our incessant nagging at the checkout). I distinctly remember one particular year with an awesome Malibu Barbie themed one though, a good year. 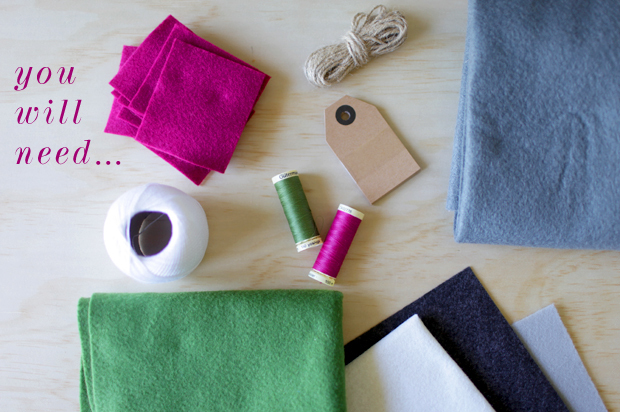 Felt – several colours, I had shades of grey, white, green and a bright cerise. 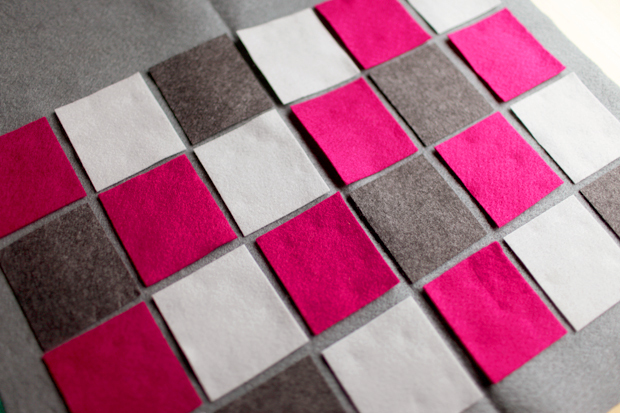 A4 sheets will do fine for the pockets and shapes, but you will need to buy it by the metre for the actual backing/main piece of the Advent calendar. Co-ordinating thread – I bought some to match, but you could do a contrasting colour, or I even spied some fancy looking gold or silver thread at Spotlight. Dowel – two lengths the width of your Advent calendar. Handy hubby cut and sanded mine for me, they were 2.5cm in diametre. Kraft tags – I bought pre-made ones, but you could definitely make your own out of card, or cut out different shapes if you like, freehand or using craft punches. Safety pins – I used mini ones to pin on my date tags. Crochet cotton or embroidery thread – something thin but strong to stitch on your stars. Iron on fabric adhesive (like Vliesofix or Heat N’ Bond) – optional but is handy to get smaller felt shapes to sit where you want them to! First I cut my main backing piece of my Advent calendar, mine measured approximately 50 x 60 cm. 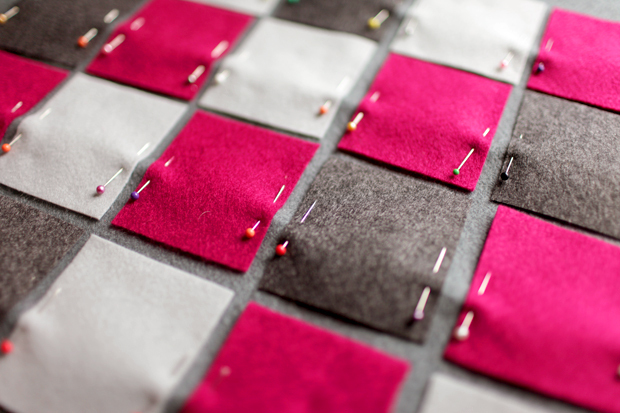 Then I cut out all my pocket squares from different coloured felts – a dark grey, lighter grey and my bright cerise colour. I made my pockets 7 x 8cm, just big enough to fit a little chocolate or treat in! 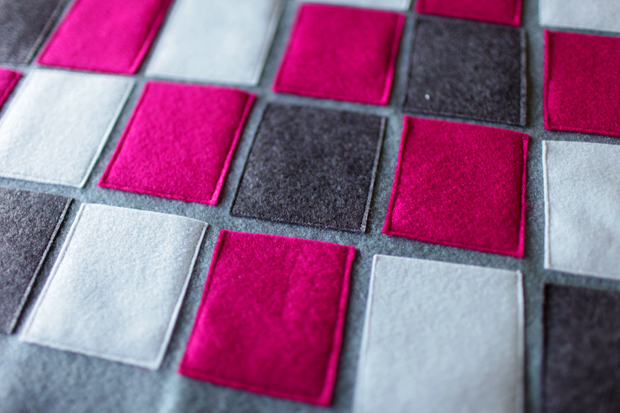 Position your pockets in a grid along the bottom of your main backing piece of felt, to find the exact centre of my backing piece I ironed it in half to make a line down the middle. I did four rows or six pockets, to make 24 days leading up to Christmas. I wasn’t overly pedantic about my placement, but I’m not much of a perfectionist! If you are that way inclined you could space them out perfectly and make sure they’re all lining up nicely. Pin all your pocket pieces in place, remembering to leave a gap at the bottom as we will need enough felt to fold over and create a casing for the dowel (I left about 4 cm). Then sew around the pockets on three sides, leaving the tops open (I used my co-ordinating thread here on my sewing machine). You should have 24 pockets now, all ready for treats or toys or whatever you like. I love the different shades of grey with the pops of cerise, an unexpected Christmas colour, but totally a happy and celebratory tone too, and contrasts so well with the green rather than the traditional red. 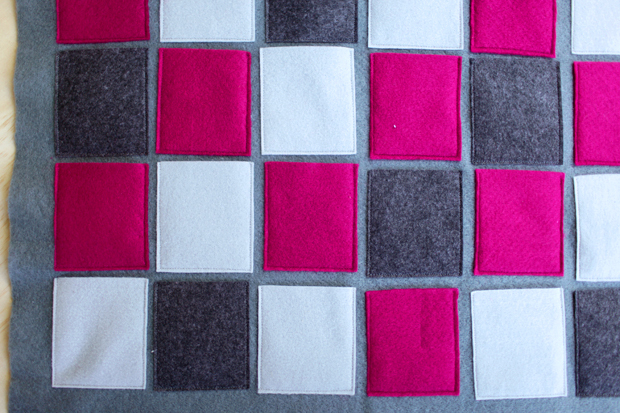 I was a bit random in my placing of different coloured pockets, and quite liked how it turned out! Now in your top section of your Advent calendar you can decorate with any Christmas shapes you like, Spotlight even has pre-cut ones. I wanted to make a Scandinavian village scene, with sweet little houses with chimneys and green pine trees. 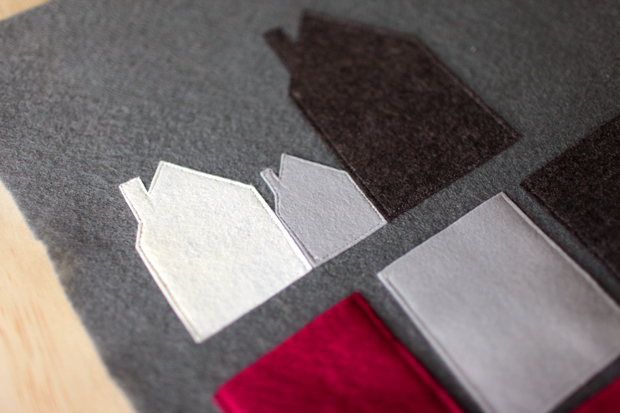 I ironed my fabric adhesive to the back of my felt (light grey, dark grey, white and green) and then drew my shapes onto the paper now adhered to the back of the felt. Remember this will be the back of your shape so you’ll have to draw a mirror image – if I wanted my chimney’s on the left of the houses, I’d draw them on the right etc. I used the houses from this illustration as a guide. My pine trees were just simple tall triangle shapes. 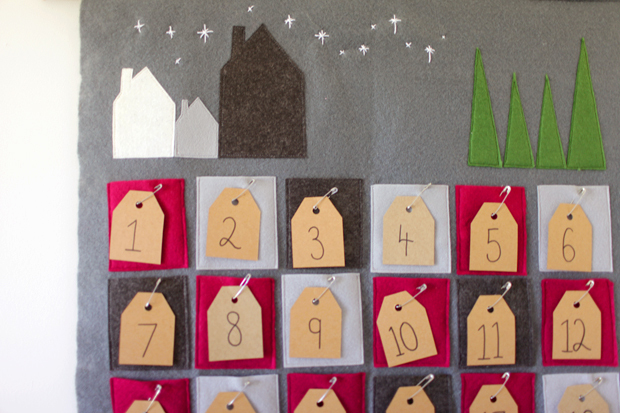 Cut your shapes out and peel off the fabric adhesive paper, position on your Advent calendar where you would like. Remember to leave a gap at the top as we will be folding over to create a casing for the dowel, just like the bottom. Iron on your shapes to hold them in place, then sew around them just like you did for the pockets. As these pieces are smaller and with points they can be trickier to pin in place, which is why I like to use fabric adhesive, but if you don’t have any you could definitely just pin lots! 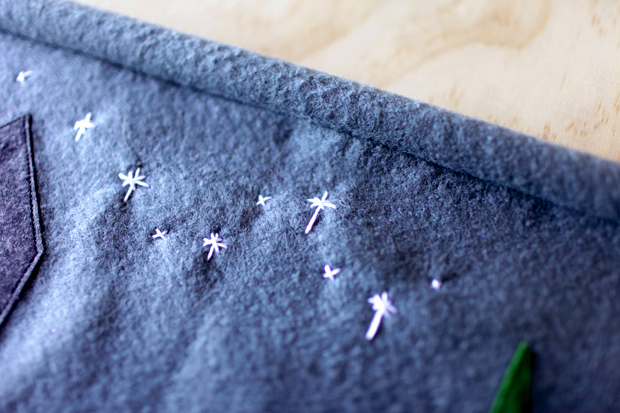 The finishing touch to my Scandinavian village scene was some twinkling stars in the Christmas sky. I stitched on simple star shapes using my crochet cotton, big ones and small ones randomly across the tops of my houses. To create your casings for the dowel simply fold over your top and bottom of your Advent calendar (you can iron it if you’d like) and sew along to create a long pocket. My dowels were 2.5 cm in diameter, so I made a 3.5 cm casing. Slide your dowels through each casing, my dowels overhang by about 3-4 cm at each end. 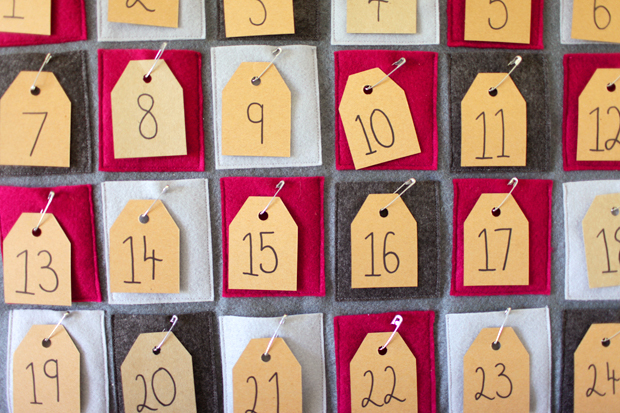 The last step to your Advent calender is of course to add the numbers to know which day you’re up to! I simply wrote out 1-24 on my kraft card tags and pinned one on each pocket. Attach a piece of string to your top dowel and you’re done! 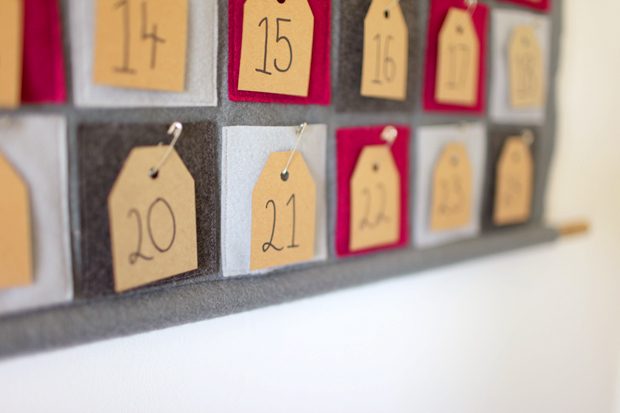 A Scandinavian inspired felt Advent calendar you can use every year in your home. 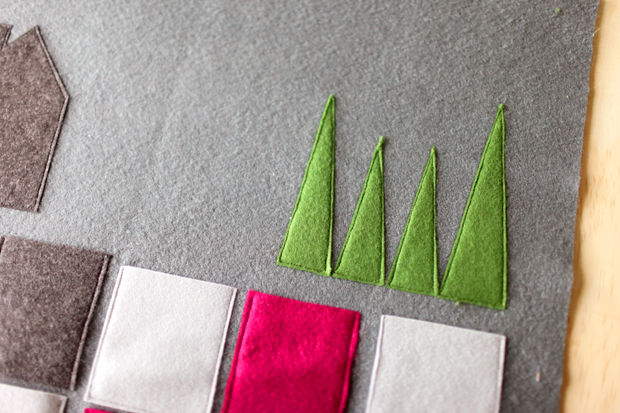 You can use more traditional Christmas colours if you’d like, or completely different and do brighter fun colours. 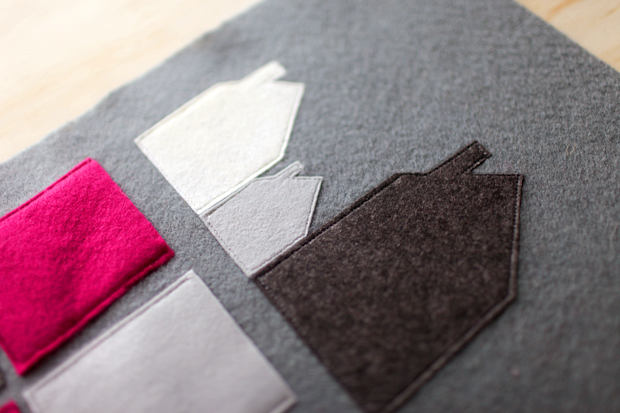 Mix it up with different shapes, different tags or even different fabrics. 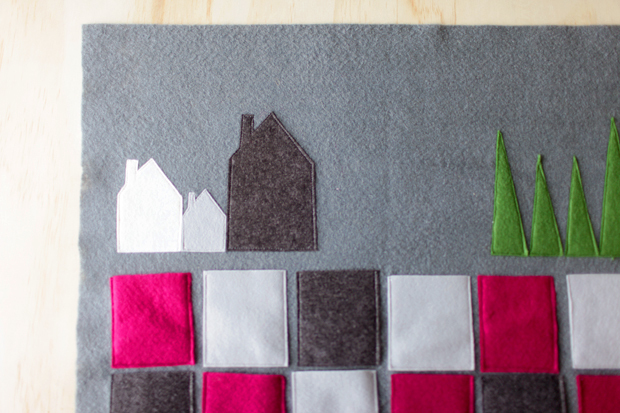 Felt is so great because you don’t have to hem the edges, they won’t fray, it’s easy to work with and very forgiving – even if you’re the most beginner of sewers or crafters! And the best bit? 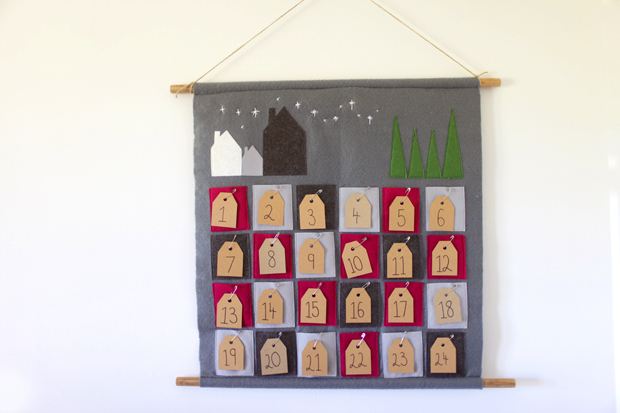 You can win this Advent calendar I made! Yep, I’m giving it away. 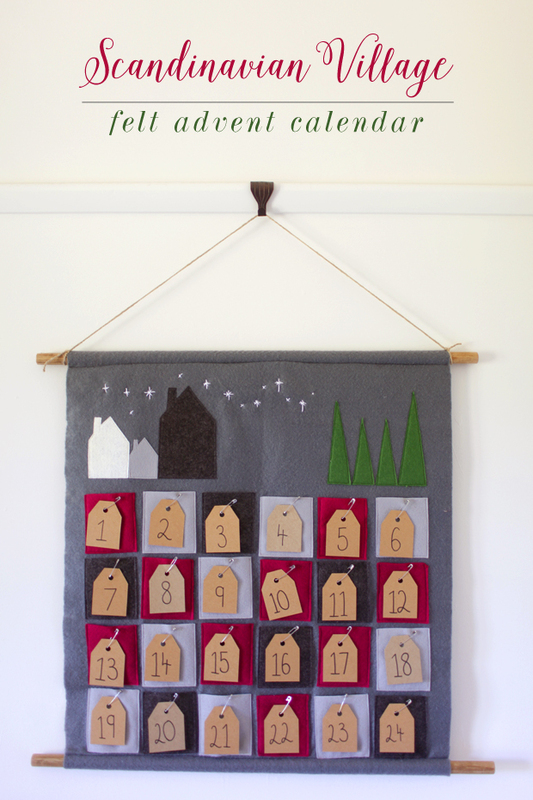 Simply leave a comment on this post, or on the She Sows Seeds Facebook page on the post linking to this tutorial, or on my Instagram photo of this Advent calendar and I will choose one person to be the recipient of their own felt Advent calendar to kick off the month of December. Ho ho ho! Did you have Advent calendars growing up? A more traditional permanent one that gets dragged out every year? Or just count down the sleeps until Santa came from about July?! This really is stunning, Emma! It so simple but beautiful, what Christmas should be! Emma! Where do you find the time? With my very own blossom, I can’t remember the last time I did anything crafty! I’d love to have this hanging on my wall for my girl. This is just gorgeous, you are so clever! I would adore this for my 16 month old little girl, growing up I’m sure she would think it’s as beautiful as I do. Its really lovely, would love to hang it on my wall!. I was obsessed with those cheap chocolate cardboard calenders when I was little as well, but don’t think I ever got one!! It’s gorgeous!! Would look beautiful on my wall ?